'Forrester's Lodge' is one of only four dwellings at the end of a quarter mile woodland track, fully self-contained and very well-equipped. With 30 acres of private woodland paths to explore and only a mile from the nearest village store and pub at Mawgan. Forrester's Lodge is also only a mile from the creek-side village of Gweek with the famous Seal Sanctuary, The Black Swan, post office and Spar general stores. The tree lined road from Gweek follows the tidal creek along the wooded valley with a turning off through a shallow ford, and along the private track. Visitors have use of the spacious garden and the private woodlands. (There are footpaths around the woodland). Entered up two steps to the front door but then all on one level, into the hallway with the lounge immediately off. Lounge is very large with two, three seater sofas and two armchairs, open fire with granite fireplace, widescreen TV, SKY (basic package plus movies), DVD and CD player. Large sliding doors lead outside to the patio. New Conservatory is off the lounge, also being a very large size and having extra comfy seating and coffee table. Bedroom one is a double room with en suite shower room, pine double bed, bedside tables and lamps, double wardrobe, chest of drawers and small dressing table with mirror. En suite has matching toilet and handbasin with shaver point over, extractor fan and shower cubicle with 'Mira' power shower. Bedroom two is another double, similar to bedroom one, but without the dressing table. Bedrooms three and four are twin rooms, each with two 3' single pine beds, bedside tables and lamps, double wardrobe and chest of drawers. Family Bathroom is a good size, with large corner bath with seat, matching toilet and handbasin, separate shaver point with mirror, new extractor fan and an extra large shower cubicle. The Kitchen is also large enough to cater for a property of this size easily. With a microwave, dishwasher, breakfast table and seating for eight, double 'range' cooker with ceramic hobs, two hot plates, two ovens, a grill and a plate warmer. A door from the kitchen leads to the utility room with airing cupboard, washing machine, tumble dryer, sink and fridge freezer. There is a large range of books for your use, suitable for children and adults. Outside there is a private, large paved patio area with two picnic benches. There is also about three acres of sloping lawn, for your use only, and 30 acres of woodland walks. Rental includes electricity, bedlinen, towels, central heating. We regret no pets and you are requested to smoke outside please. Broadband Access included. Adjoined to Forrester’s Lodge is property 184 - The Cuckoo’s Nest, a self-contained one bedroom annexe that may be let separately or in conjunction with Forrester’s Lodge to provide total accommodation for up to 10 people. 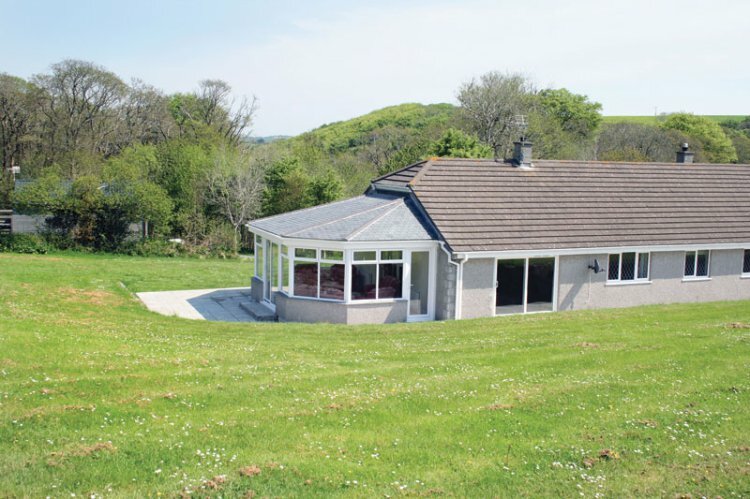 Also available attached to the owners’ property is 370 Pheasant’s Retreat an open-plan first floor lodge sleeping two. ﻿And now, the newest addition, Woodpecker's Hideaway P536. Forrester&apos;s Lodge is part of the Treverry Woods family of cottages, the other cottages are displayed below.